This pattern features Textured Swags - an original chevron stitch pattern in a variation for knitting in the round. The appearance is identical to that of the Queen Christina Scarf, though the mechanics of creating the pattern are somewhat different. This is shown in Twisted Fiber Art’s DK-weight Duchess yarn. 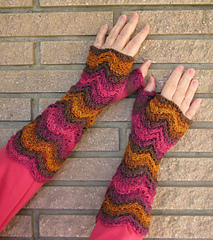 The stitch pattern works beautifully with self-striping yarns. • The fabric is very stretchy, so the same size can fit men or women. 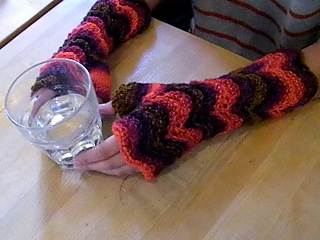 However, sizing includes a variation for those with slender arms plus two sizes of thumb. 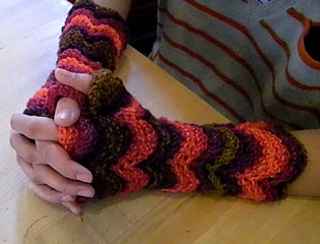 • The palm of the hand is in stockinette while the back of the hand is in the stitch pattern. Short rows are included so that the length of the back of the hand can be increased – the short rows are cleverly concealed so as to be almost unnoticeable. • The pattern is arranged so that only two of the five pages need to be printed to contain all the instructions except for the list of Terms. 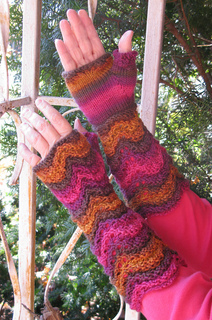 • DK weight yarn, TFA Duchess self-striping, together with a pattern for fingerless mitts. • Aran weight yarn, TFA Queen in long stripes, together with a pattern for a reversible scarf. • Super bulky yarn, TFA Empress, in an evolution, together with a pattern for your choice between two hats. 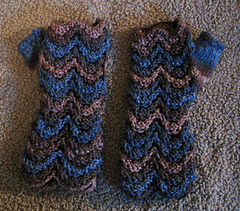 All three patterns feature the same stitch motif.